If there are no walking clubs or groups close to where you live why not start one yourself? It’s an ideal opportunity to socialise and to make new friends and it’s often more fun than simply walking alone whilst also enabling you to become more committed towards your own walking. 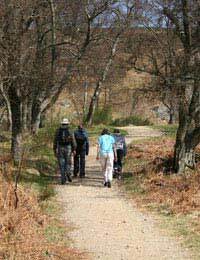 Starting up a walking club needn’t involve expensive advertising. You should be able to put up posters in your local library, health centre and, maybe your local post office or one of your local shops, either for free or for little money. The poster should invite potentially interested walkers to a meeting at a certain place on a set time and date. You may be able to hold this in your local community centre or library. Remember to include your name and a phone number and/or an e-mail address where you can be contacted. Don’t be put off by the thought of holding a meeting. A meeting of this nature will tend to be pretty informal and will evolve naturally. Some of the things you’re likely to discuss will be how often you intend to hold organised walks, for example, every weekend, one weekend per month etc. Are you going to be walking locally or do you intend to travel to scenic areas some distance away? If you’re travelling, you’ll need to discuss transportation arrangements. Remember, all interested parties may not drive or have their own car so you may need to make provisions for that and have some car owners willing to take those who don’t have a car or, perhaps, consider hiring a minibus. As things progress, you’ll want to discuss different routes, what time you’ll set off, where you’ll meet and how far you intend to walk. Other issues might include whether or not you plan on walking year round or just in the spring and summer? Are you going to have regular meetings or simply meet up whenever you walk? In fact, your walking club can be as formal and organised as you want it to be. For example, you may want to appoint a treasurer and have a club bank account or it can be ‘loose’ and informal instead. People who join a club of any kind like to keep in touch with other members. The internet has made this even more possible and you may want to set up a website and/or a forum where people can exchange views and tips and to share information about future planned trips etc. You may be looking to combine your walking with another focus. Perhaps, your club is aimed at helping people to get fit and lose weight? If so, and you hold regular meetings, you could maybe get a local ‘guest’ speaker such as your doctor or a fitness instructor to come along to extol the virtues of walking as a fitness activity. You might also look at other ways to recognise members’ achievements to increase their motivation. Maybe, you’ll want to produce a regular newsletter which you can either post or e-mail to members. This could include personal accounts and photographs of recent trips and details of planned forthcoming trips, social events etc. In fact, there are no limits as to what your club can include. You’ll find that people come with many different skills and are willing to ‘add value’ to the club in ways that you’ve not thought of previously. The bottom line being that you’ll all be sharing a common interest, you’ll make new friends and your group will enable all its members to enjoy their walking even more than they did previously. It may even give some new walkers a new lease of life in participating in a group activity that they’d never before dreamt of joining or didn’t know where to start looking.